Clones, power, money, and fame. These topics are all key in Nancy Farmer’s award winning House of The Scorpion. She has made yet another masterpiece of literature, The Lord of Opium. This book takes the perspective of Matteo Alacrañ. The Alacrañ families most famous member is El Patron, a boy from Aztlan. This poor boy was so poor that when he went to America without anything, he was better off than before. After growing up, he struck a deal with Mexico and the United States governments which placed him in possession of a large strip of land between the countries. On this plot of land, he grew Opium, an illegal drug, which he refined and sold all around the world. Although he promised not to distribute drugs to the two countries, it was still widely distributed in them. He established the farm patrol, an army of ruthless criminals, brainwashed to follow his command. They captured illegal immigrants, which he turned into slaves for his poppy plant fields. Matteo Alacrañ was a clone of El Patron, until the ruler of the drug empire died, leaving his drug empire for Matt to control. 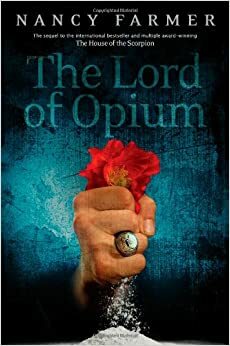 In Nancy Farmer’s Lord of Opium, Matteo Alacrañ doesn’t even know who to believe, or even trust. Many people may think that this book is dark and unpleasant because of it’s plot which has to do with drugs and slaves, but, the writing was amazing and I thoroughly enjoyed reading it. It had many events in which I was left chewing my nails until I had another chance to read it. One example of this was on page 208 when the story read, “Workers swarmed over the train to remove cartons of supplies. María never appeared”. This was a specifically tense section of the book because one of Matt’s enemies was responsible for a friend’s death. Despite it’s gruesome theme, I was still entertained every time I read it. Because of all of the cliff-hangers and technology themes, I would judge this book as a great suspense and science-fiction story.